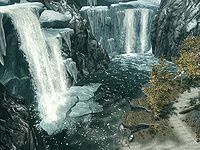 Dayspring Canyon is the wilderness area surrounding Fort Dawnguard. The cave entrance to the canyon is located southeast of Riften, just north-northeast of Stendarr's Beacon. † The grindstone and tanning rack are on the roof of Fort Dawnguard, reachable by climbing the west stairway inside and exiting at the top. 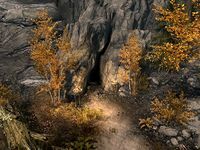 While these are technically in Dayspring Canyon, as opposed to part of Fort Dawnguard, they can only be accessed via the fort. 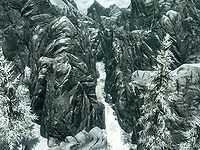 The entrance is to the canyon is through a narrow fissure in the rock wall a short distance further east of the path that leads up to Black-Briar Manor, along the road leading to Morrowind. It leads into a narrow crevice that eventually opens out into the isolated canyon. Once through the fissure there is a snowy path heading east with a few snowberry bushes along it. As the path turns to the southeast it opens out with a view of a pool which is fed by melting ice falling as waterfalls from the surrounding peaks. The canyon is fertile containing many fauna and flora including red and purple mountain flowers, spiky grass and thistles, several types of fungus including bleeding crown and fly amanita, many butterflies and blue butterflies during the day, and torchbugs and luna moths in the evenings and at night. The pool is full of salmon and there are mudcrabs nearby. rabbits, foxes, and elk abound in the canyon. The path leads down passing the shore of the pool, where you find a rowboat and two racks—one holding seven whole salmon and the other drying a net with two food barrels nearby. Past this point the path turns to the north. Ahead you get your first view of a fort off to the northeast. Further uphill to the north is an entrance to Mossy Glen Cave. As you near, the fort is identified as Fort Dawnguard. It appears to be a vast sprawling structure. The path continues past the start of a wooden palisade wall with some barrels of food behind. There are tools and a saw horse implying that this is recent work. On your right is a wooden lookout platform. The path passes under an arch formed by a walkway far above. Beyond this is a campfire with Durak standing nearby practicing using a crossbow. There is a wood chopping block to the left. You can recover many steel bolts from the tree stump Durak has been using for target practice. Beyond this is a fenced vegetable patch containing eight gourds, seven cabbages, and five potato plants. The path turns around to the south and approaches the entrance to the fort. Passing on your left is another wooden palisade wall with a gap in the middle. On the other side of it most of the trees have been cut down for the construction. There are two snowberry bushes and, in the northern corner, another entrance to Mossy Glen Cave. To the right of the gap in the wall is another wood chopping block and woodcutter's axe. The first time you approach the fort you will meet Agmaer who has also heard of the vampire hunters and is looking to join. At the entrance, Celann will instruct you to enter to meet their leader. If you access the roof of Fort Dawnguard, you can find the One-handed skill book 2920, Morning Star, v1 next to a bed roll, as well as an amulet of Talos resting atop a barrel. Esta página foi modificada pela última vez à(s) 18h26min de 9 de janeiro de 2016.